Transitioning to a bigger bed can be a stressful process for your little one (and for you! ), so a bed that can help them feel at home gets a thumbs up from me. The House Bed Collab from The Market NZ is clever in its simplicity. 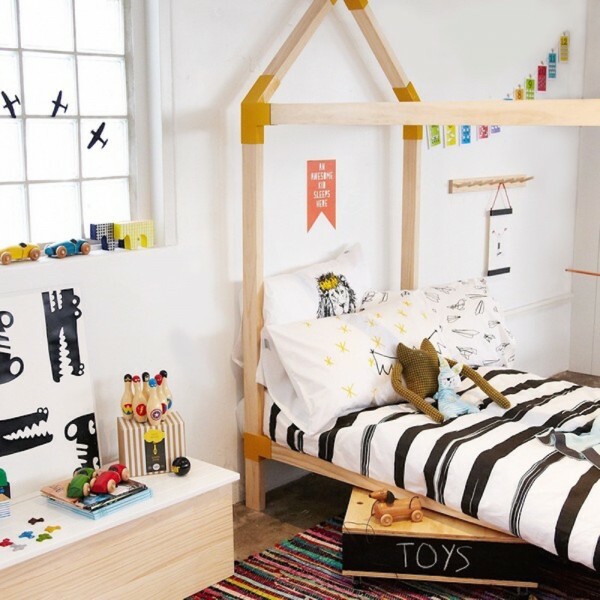 It’s a beautiful looking bed by itself, but also leaves room for your kid’s creative flair as you let them pick furnishings to decorate their ‘house’. Once they’ve made their single bed sized home, it becomes a great place to imagine as well as to dream. Plus, at the risk of ruining the effect of the nice clean lines, you cab throw a sheet over the top and it makes for a pretty great cubby house (so much nicer than the sheet between two couches that often adorns my living room). A MarketNZ collaboration with New Zealand brands Burrow & Be and Black Sand Furniture, the bed is handmade from New Zealand pine and aluminium brackets in your choice of five colours. It comes flat packed with instructions, so your little one can watch as you ‘build’ their house. The House Bed is available through The Market NZ for NZ$1250 plus shipping.